Drawing upon stories from his own career, Godsey shares how innate psychological flaws in judges, police, lawyers, and juries coupled with a "tough on crime" environment can cause investigations to go awry, leading to the convictions of innocent people. 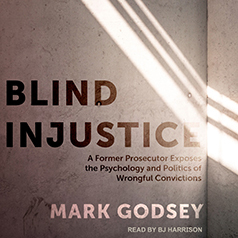 Godsey explores distinct psychological human weaknesses inherent in the criminal justice system—confirmation bias, memory malleability, cognitive dissonance, bureaucratic denial, dehumanization, and others—and illustrates each with stories from his time as a hard-nosed prosecutor and then as an attorney for the Ohio Innocence Project. He also lays bare the criminal justice system's internal political pressures. How does the fact that judges, sheriffs, and prosecutors are elected officials influence how they view cases? How can defense attorneys support clients when many are overworked and underpaid? And how do juries overcome bias leading them to believe that police and expert witnesses know more than they do about what evidence means? This book sheds a harsh light on the unintentional yet routine injustices committed by those charged with upholding justice.